Happy Lunar New Year to all! Chinese new year holidays went pass just like that. I hope all of you had an enjoyable time getting or giving ang baos and visiting your relatives in this new year. Chinese new year is always associated with wealth and prosperity. While it doesn't happen by chance, some knowledge on how to grow our money will help in this financial journey. Some people pay thousands of dollars just to attend seminars but actually free ones are equally good out there. In this new year, there's this wealth summit where you can learn more about finance and investments. The best thing is you can learn from the comfort of your home and its totally free with no terms and conditions attached. 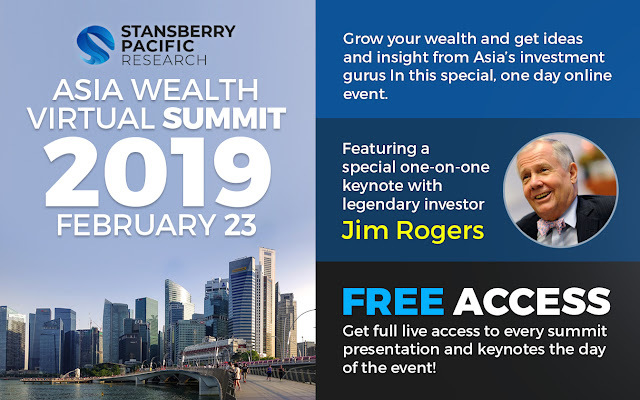 Honestly, this is the first time I heard of a virtual summit with great speakers including a keynote with legendary investor Jim Rogers who will be sharing where he will be putting his money for investments in 2019. Other speakers include Alvin Chow from Dr Wealth and many other topics such as value investing, trading and economics will be covered. If you want to learn how to make your money work harder for you this new year, click here to register and get your free access to this virtual summit happening on 23 February 2019. It must be a great event. I wish I could be a part of this event. Thanks a lot for this info.